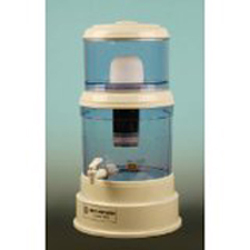 Drinking water purification is easier than you think. If you're like me, you've tried different bottled water - some cheap - some not so cheap. You've probably tried filters hooked to the kitchen faucet and had canisters under your sink. All of this was done in your quest to find affordable, good tasting, clean water. None of them really worked, did they? Fortunately, I found a very affordable water purification system that does work. This purification system removes toxins from your water when used with liquid Adya Clarity™. Adya Clarity™ is made from biotite or black mica, a natural occurring mineral. Dr. Asao Shimanishi from Japan, developed a process which yields a liquid form of this super mineral locked inside lava. This magical liquid removes contamination and creates natural, oxygenated water. And, the water is not altered with chemicals or dangerous compounds. This unit is free-standing and does not use electricity. Instead, it uses gravity to filter the water through 0.2 micron ceramic filter in the top portion. This traps toxic particles. Then, the water goes through a multi-level filter of raw earth elements which includes activated charcoal, quartz and zeolite. The end result is crystal clear water in the bottom of the unit. Believing is seeing. This is what Adya Clarity™ pulled out of my water. 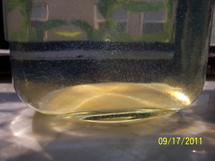 The orange scum at the bottom of the glass are the pollutants in the water which settled out. I took this video one morning before my first cup of coffee to demonstrate how the system works. Its important to know the company that is providing this product and its history. Adya Clarity is committed to providing clean drinking water to you and the world. The drinking water purification system may be found in the Store on the main page of this site under the category of Detoxification along with various sizes of Adya Clarity™ . Adya Clarity™ transforms your toxic water into clean, living, oxygenated, mineralized water. As far as I am concerned, this is the healthiest and best drinking water purification system money can buy. Besides Adya Clarity™ cleaning your water, it also does a full body detoxification. If your body is not detoxed, you may find yourself with multiple health issues, including iodine deficiency.